Favorites at Gourmet Delights will always be outstanding. The Carnaroli rice cultivated at Colombara, being the only variety sown since 1997, is 100% pure and therefore produces uncontaminated Carnaroli seeds. Once you have tried it, you will never look back! Click here for risotto recipes! These amazingly delicious little cockles are also called heart clams or Berberechos. They are hand-packed in brine and deliver a pure, beautiful taste of the sea. Open the can and enjoy! Conservas de Cambados is based in Galicia in Northeast Spain. This is the region of the Arousa Ría, which is well-known not just for its size, but also for the richness of its marine life. This area is particularly suitable for harvesting clams, cockles, mussels, and other bi-valves. The Spanish believe canned seafood is a delicacy to be shared and enjoyed! They take great pride, and great care, to harvest the best seafood and package it with the utmost care. The result is the purest, most delicate, and exquisite tasting seafood on the planet! A true delicacy. Ingredients: Cockles, water and salt. Buy 3 or more, and get them for only $35 each! Order now to get the on-sale price! Are you tired of cutting the capsule off a wine bottle with a knife?? Have you had plastic foil cutters break on you?? This foil cutter creates perfect, elegantly cut wine capsules each and every time. 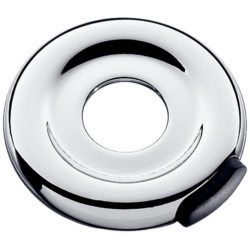 The Chromium-plated cast metal is a beautiful, sophisticated design that fits into every kitchen. Mine has lasted forever! It may be the last foil cutter I ever need to buy! J. Leblanc has changed little since 1878, the year it was founded. It is still run by a Leblanc, Jean-Charles, grandson of the founder. It is still located in the southern most village of Burgundy, Iguerande, and it still manufactures the highest quality, small-batch, handcrafted nut oils in France.... if not the world. J. Leblanc starts with the careful selection of the absolute highest quality whole nuts available, grown on many of the same farms that J. Leblanc has been doing business with for generations. For each batch of oil about fifty-four pounds of nuts are ground into a paste using the huilerie's original granite mill. In order to guarantee an even roast, this paste is constantly stirred in a roaster for 10 minutes. The roasted paste is then transferred to a mechanical press where it is divided in half and separated with filter cloth. The oil is expressed at 22,000 pounds of mechanical pressure. After pressing, the oil rests from seven-to-fourteen days to allow the sediment to settle before bottling. This is a labor, and time, intensive process which produces only 300 liters a day. These nut oils are pure, unadulterated, unfiltered, and unrefined. J. Leblanc nut oils are made to order. One of the most important facts about Huilerie Leblanc's production is not the "how" but the "when". Since Huilerie Leblanc does not have large storage facilities, or refining capabilities, production takes place when orders come in - guaranteeing the freshest nut oils delivered to your door. It's not only a difference you can taste - in their clean, bright, and deep flavors, but also extends their longevity by up to a year. In the United States, J. Leblanc is finding its way to renowned restaurants like The French Laundry, Mandalay Bay, Delfina, Campanelli, One Market, 231 Ellis, and Hawthorn Lane to name a few! 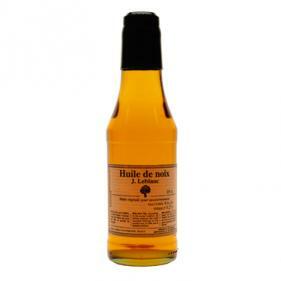 Nut oils can be used for salad dressings with quality vinegar such as champagne, Banyuls, sherry, or raspberry. The usual ratio is three parts oil to one part vinegar. Please refrigerate J. Leblanc nut oils after opening. 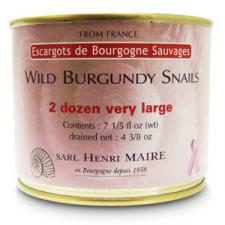 Wild Burgundy Snails, a timeless French delicacy, are finally available to gourmets in the United States. The preeminent purveyor in Burgundy, Henri Maire, has satisfied the most discriminating palates in France since 1938. In Michelin-rated restaurants like Paris' Taillevent, Chez Lasserre, and La Grande Cascade, and in nearly 400 of America’s top dining rooms including Brindille-Chicago owned by Michelin-starred chef Carrie Nahabedian , these snails grace the finest tables. Similarly, retail consumers who pride themselves on using impeccable products, serve only the best in their homes. As with all gastronomic delicacies, escargots exhibit varying levels of quality. Henri Maire's snails have maintained an unwavering reputation for being the best of the best amid the demands of the culinary capital of the world. The formula is quite simple, they begin with Wild Burgundy Snails (Hélix Pomatia Linne), delivered live. These savory delights are then hand-sorted by size, washed, and cooked in an aromatic bouillon according to the same ancestral standards used in 1938. These snails are treated and cooked according to the strictest hygienic standards (HAACP Certified) and are delivered to you in perfect condition. This delicate, carefully selected octopus is uniformly portioned and traditionally prepared in a traditional Galician sauce of paprika, onion, oil, and salt. Conservas de Cambados is based in Galicia in Northeast Spain. This is the region of the Arousa Ría, which is well-known not just for its size, but also for the richness of its marine life. Pulperias, restaurants that specialize in octopus, are in every Spanish village. 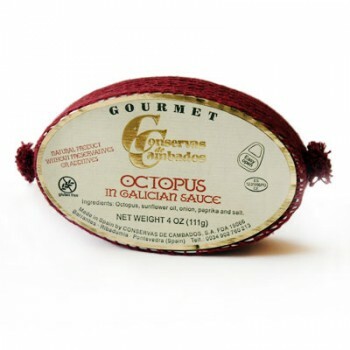 Conservas Cambados has packaged the wonderful experience of the perfect octopus and smoky sauce so you can experience it in your own homes. Enjoy! Open the can and enjoy! Place on crackers or sliced baguette for a wonderful, easy appetizer. Toss with freshly cooked pasta! Ingredients: Octopus, sunflower oil, onion, paprika, and salt. This lush spread brings together the wonderful flavors of northern Italian cuisine: mushrooms, hazelnuts, truffles, and aged cheese. 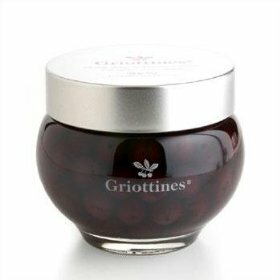 We love to use it when making crostini, creating a flavorful sauce for pasta, and topping cooked chicken or grilled steak. I Peccati di Ciacco is a first choice for lovers of Piedmontese cuisine at its best! Made in the village of La Morra, outside Alba, world-famous for black & white truffles, each product is made in small lots according to regionally-inspired recipes with careful attention to maintaining freshness and homemade goodness. Ingredients: Champignon mushrooms (Agaricus Bisporus), olive oil, Summer Black Truffle (Tuber Aestivum Vitt.) 10%, Parmesan cheese (milk, salt, rennet) 10%, white wine, hazelnuts 4%, lemon juice, pine nuts, salt, flavors, lactic acid. From their home base in the Abruzzo Region of Italy the Iacovanelli family, ADI’s owners, care for their bees with strictly organic techniques that blend solid traditions with contemporary innovation. They only harvest their honey when it is fully mature: when flavor, color, aroma, and nutritional content reach their peak. 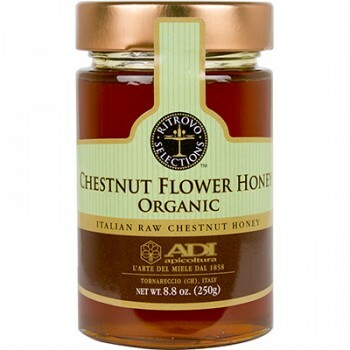 This is a rich, dark amber and liquid honey from the chestnut tree flowers of the Abruzzo hills. We love this savory honey as it is perfect for glazes, pairs wonderfully with Taleggio and Fontina cheeses, and is great on roasted meats. It is also incredible on radicchio, on squash, and in pumpkin soups. The ELIS electric rechargeable u'Select pepper grinder has tomorrow’s technology tamed, yet has inherited two centuries of PEUGEOT know-how. Its mechanism carries a lifetime guarantee. The exclusive u'Select grind adjustment system ensures you get the exact grind you want. The rechargeable battery adds further convenience. 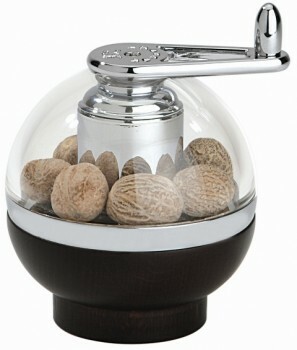 This beautiful nutmeg grinder can store 7-8 whole nutmeg seeds. The mechanism has a double stainless steel grater blade and a strong claw, which enables you to finely grind your nutmeg without risking your fingers! Paris stands out from the crowd as the flagship model of the Peugeot collection. Its mechanism carries a lifetime guarantee. The exclusive u'Select grind adjustment system ensures you get the exact grind you want each and every time. 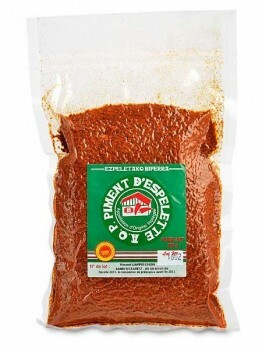 Piment d’Espelette is famous for its modulated, food-friendly heat as well as its "sweet red pepper" perfume, which bring wonderful layers of flavor to your dishes. The A.O.P. (Appellation d'Origine Protégée) designation means that this coveted spice can come only from the tiny, 22-square-kilometer region in and around Espelette, the French Basque town in a hilly, verdant region near Bayonne. The restricted area and precarious weather conditions of the Basque region limit the supplies of this precious spice. Commercial cultivation of this spice originally began as a product of housewives’ gardens. Women grew the peppers in small quantities for home meals and sold the excess for pocket money. In fact, Marie-Jeanne, the mother of our producer at La Maison du Piment, Vincent Darrichion, was one of those women! She launched her family into the espelette business from her own kitchen garden. The entire harvest is done by hand. The toil begins in late March, when the seeds must be sprouted in the greenhouse. Then in April, the seedlings are teased apart and placed into individual pots where they are tended in the greenhouse until they are about 18 inches tall. When the size is right, they are hand planted in the field. The peppers are like "indeterminate" tomatoes in that they ripen over a period of time. So the harvest can take a month or more, with many passes through the fields, as the farmer individually snaps or cuts the stem of each ripe pepper, being very careful to keep the top of the pepper intact so it will not be subject to rot. After the harvest, the peppers go back to the greenhouse where they are sun/air dried on wooden trays. The final step in this artisanal slow-drying process involves stacking these trays in a low-temperature oven for several hours to achieve the perfect texture. The A.O.P. rules strictly govern the growing area, cultivation practices, drying protocol, and the size (mesh) of the Espelette powder itself. A.O.P. 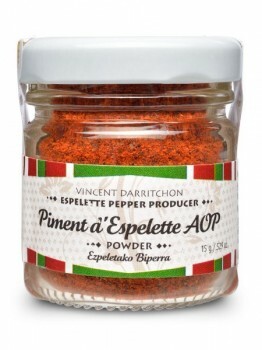 thus guarantees you are getting authentic Piment d'Espelette! Mix with sea salt, paprika, and cumin, rub over a pork chop or loin, and bake. Add Piment d’Espelette and a little lemon juice to your favorite mayonnaise. Dip fried potatoes or steamed artichokes in it. Add it to your popcorn butter for a new twist on a classic snack. Use it to season creamy roasted red pepper soup. Season baked, roasted, or mashed potatoes.... sprinkle it on your french fries! Grill shrimp with extra virgin olive oil and sprinkle with Piment d’Espelette. Perfect on grilled, baked, and sauteed fish. Ingredients: Piment d'Espelette Powder A.O.P. 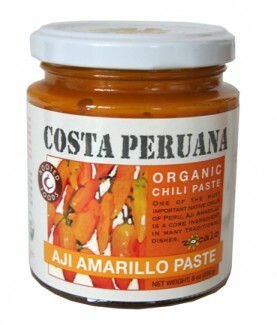 Aji amarillo, or amarillo chile, is the most common type of aji and is one of the most important ingredients in Peruvian cooking. It has a heat level of 7 on a scale of 10 (50,000 Scoville units). It is great in combination with meat, poultry, fish, vegetables, pasta, and rice dishes, and is used to season nuts. The unique flavor of the Aji Amarillo makes it worth seeking out and incorporating into your cooking. Even though it is a "chile pepper" it has a lot of fruitiness combined with its heat. It is a very versatile chile that will complement your dish without overwhelming it. This product contains no dairy, soy, refined sugar, preservatives, additives, trans-fat, or genetically modified ingredients (GMOs). Marinate your fish, chicken, or pork before cooking. Temper the heat in the Michelada: Aji Limo Spiced Beer Cocktail by substituting the Amarillo Paste. Ingredients: Organic Amarillo chili, water, citric acid. Les Confitures à l’Anciennes Andresy (old fashioned jams) are cooked in copper basins with whole selected fruits, cane sugar, and lemon juice to refine when necessary. No preservatives, coloring agents or artificial flavors... All natural! Spread it on a baguette, top with a smear of foie gras terrine, arugula, & brie. This classic flavor is perfectly suited for pork or poultry dishes. Mix in with a sausage stuffing, or spread it on some Manchego for a sweet and salty treat. We love spreading it on slices of bread for a fig and proscuitto sandwich! 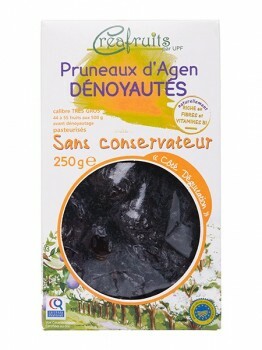 Ingredients: cane sugar, figs, concentrated lemon juice, fruits pectin. Olivar de la Luna Organic Extra Virgin Olive Oil is made from 100% Nevadillo Blanco olives that are indigenous to Sierra de Cordoba in the northern regions of Andalucia, Spain. Through the production of this high quality organic extra virgin olive oil, Olivar de la Luna is able to protect their local environment and agricultural traditions. 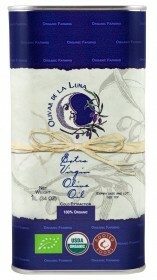 Olivar de la Luna is a very fruity extra virgin olive oil with a luxurious mouthfeel. It has an abundance of healthy polyphenols, anti-oxidants, and Vitamin E.
CAAE Certification which states that it has met European Regulations for Organic Production. Member of the Spanish Association for Biodynamic Agriculture (AEAB). No preservatives or artificial flavors. This product contains no soy, gluten, nuts, dairy, or genetically engineered ingredients. Produced and bottled by Olivar de la Luna with olives grown, harvested, and pressed at the Olivar de la Luna Estate in Spain. The Savini family business is world famous for their truffles. Since the 1920s, the family tradition of handcrafted truffle products has passed down over four generations. The truffles are individually selected by Luciano and Cristiano Savini. They are personally out with the truffle hunters in the heart of Tuscany so they can guarantee the highest quality and ensure the origin of each and every truffle. 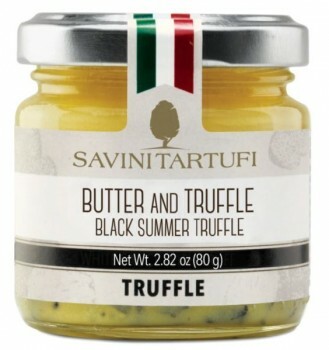 The production of truffle products, like this exceptional truffle butter, is then carried out using traditional methods and solely at the request of the importer. This guarantees both the freshness of the product and the 'shelf life'. Every jar shows a "best by" date so you know you are getting the freshest butter available. 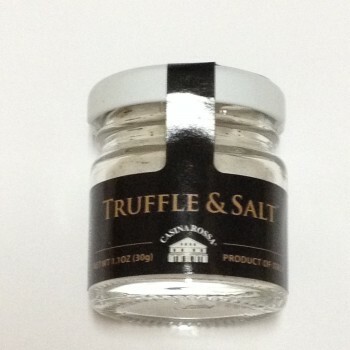 Large visible pieces of real truffle are in every jar. Start your day off with a perfectly cooked egg and some truffle butter. Put it on hot baked potatoes, mashed potatoes, and french fries. Place a spoonful on your hot steak and watch it explode with truffle flavor. A little bit with seared or grilled scallops is otherworldly. Truffle butter for lobster? ABSOLUTELY! Add a heaping teaspoon to your risotto 5 minutes before it is done to make truffle risotto! 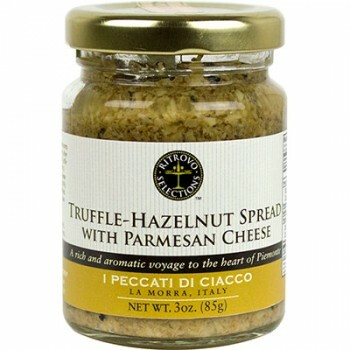 Toast some bread, spread some truffle butter on it, add a touch of grated parmesan cheese, and serve as an appetizer. Mix together an egg yolk, a teaspoon of truffle butter, copious amounts of grated parmesan cheese, and two teaspoons of extra virgin olive oil as a sauce for pasta. Rub it on a hot ear of corn on the cob. Use it as your butter for popcorn... Truffle popcorn! Add some Truffle Salt too!! A perfect dipping sauce for a freshly cooked artichoke. Buy 2 or more, mix and match, truffle butters and get them for only $25.00 each! That's a 16% savings! Shelf stable. Refrigerate after opening. In the beautiful Tuscan hamlet of Loro Ciuffenna, Sandra Masi, Viviano Venturi, and their small, skilled crew produce an amazing variety of organic products. Their focus is on regional, traditionally-inspired dishes created from local recipes and containing heirloom cultivars. Their 100% organic product line is internationally acclaimed. All Radici products are known for pure, focused flavors that elevate any home-cooked meal to restaurant quality. 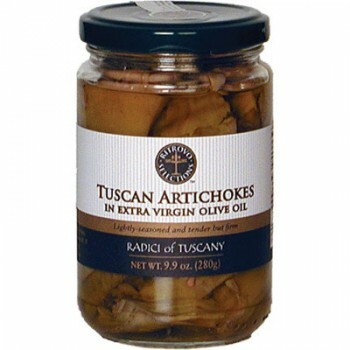 Radici of Tuscany's Organic Artichoke hearts are packed in extra virgin olive oil with a hint of seasonings. Called Carciofi in Italian, these firm and tender organic artichoke hearts are irresistible. Eat them right out of the jar, they are that good! Everyone who tries these organic artichokes says the same thing, "these are the best artichokes I have ever had!". And remember to save the extra virgin olive oil for drizzling on bread, or for your favorite salad dressings! Ingredients: Artichokes, extra virgin olive oil, vinegar, salt, spices. This wonderful blend of ground Italian black truffle and sea salt is irresistible with eggs, grilled vegetables, baked potatoes, french fries, pizza, in soups, and on popcorn! 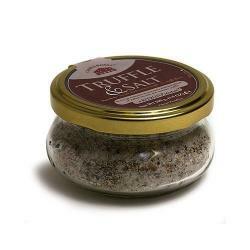 Main dishes, such as delicate fishes and light pastas, come alive with a sprinkle of this magical salt. Sprinkle it in chicken soup as you put it in the bowl for an amazing flavor!! Every dish, every bite, becomes a special mouth-watering occasion. 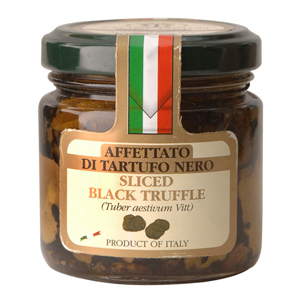 If you love the taste of truffles, this is a MUST HAVE in your kitchen! Featured on Oprah Winfrey's O List and in the December 2009 issue of Bon Appetit Magazine! Same great salt, in a smaller jar. Perfect for your desk, briefcase, purse, dorm room, or suitcase. And of course perfect as a gift. We are so proud to be able to offer you our own branded extra virgin olive oil. 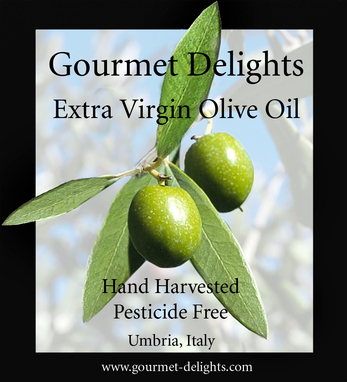 Our goal was simple, to find an amazing extra virgin olive oil from Italy for daily use. We asked for it to be full bodied and delicious. We also asked for a price point below $20. The wonderful people at Trampetti came through with their leccino/frantoio olive blend. They continued to meet the highest standards, as one would expect from Trampetti, and meet our goals as well. The Trampetti farm is located in the prestigious Assisi-Spoleto hills of Umbria’s “gold coast” olive zone. There Massimo Sisani, third-generation descendant of Eugenio Trampetti, and Federico Bibi, Umbrian agricultural specialist, dedicate themselves to the production of one of the finest organic extra virgin olive oils in Italy. Same day, state-of-the-art mechanical (vs.chemical extraction which is inferior) processing of early hand picked olives results in an extra virgin olive oil with intense yet harmonious palate. Trampetti’s high polyphenol levels (indicating quality of fruit) and low free oleic acidity levels (indicating freshness) have perennially put it at the top of all Italian extra virgin oils. Produced and bottled by Trampetti with olives grown, harvested, and pressed at the Trampetti Estate in Italy. 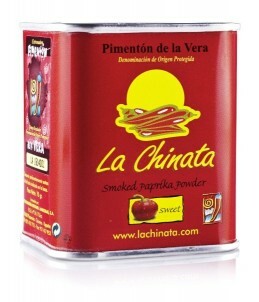 Artisan quality La Chinata (Denomination of Origin "Pimentón de la Vera") is generally accepted as the best. It is grown, smoked, and milled in the micro-climate of La Vera, Spain not far from where Columbus presented the first plants to Ferdinand and Isabela. You will find this pimentón wood smoked paprika is a unique and versatile seasoning. If there is one spice that captures the essential flavor of Spain, it is this one. This is not the bland paprika you get at the local supermarket. Three different varieties of pimiento are slowly smoked over a low flame to produce a superb, intense flavor. You will discover that our La Chinata Smoked Paprika is an excellent addition to some of your favorite recipes. Add it to a rub (try it with salt and lemon infused oil ), or as a flavoring for fish dishes, light stews, potatoes, sauces, garlic chicken and roasted meats. Lamb Meatballs with Chickpeas & Red Pepper Sauce! It is perfect in this Spicy & Aromatic Meatball Tagine. You will love it in cheese sauces, and in Mac & Cheese! This Casina Rossa extra virgin olive oil with black truffles (Tuber Aestivum which is the summer black truffle found in Europe) is aromatic yet subtle, extremely versatile, and great on risottos, pastas, pizzas, and popcorn! A real piece of truffle is in every bottle. Nicola DeLaurentiis and his wife Paola operate Casina Rossa in the Abruzzo region of Italy. They are driven to tirelessly invent, improve, innovate, and refine their products. Casina Rossa produces this extra virgin olive oil with black truffle by traditionally cultivating and harvesting Gentile, Intosso, and Ghiandaro olives from their family-owned trees. By coupling these traditional methods with modern continuous cycle processing, they produce a first class extra virgin olive oil. 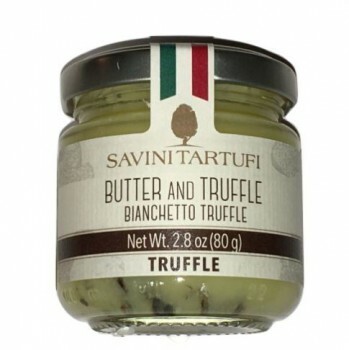 Try this extra virgin olive oil with black truffle on antipasti, risottos, and pastas. Produced and bottled by Casina Rossa with olives grown, harvested, and pressed at the Casina Rossa Estate in Italy. Do not be fooled by other truffle oils that use grape seed, sunflower, safflower, or even "olive oil"... if they went cheap on the oil you know they went cheap on the truffle. Demand "extra virgin olive oil," the best. Plus those other "truffle oils" do NOT have actual pieces of truffle in them, another cost cutting step which gives your truffle oil a chemically taste. So they went cheap on the truffle too. Only buy truffle oils, like this one, that use extra virgin olive oil and that have actual pieces of REAL TRUFFLE in EVERY bottle. That way you can guarantee you will get the pure truffle flavor you expect, and demand. It is a difference you can taste! 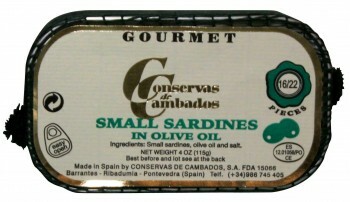 The most wonderful small sardines in olive oil we have ever tasted come from the Estuaries of Galicia, Spain. This is a true Spanish food gem and we are very pleased to be able to offer it to you. Rich in vitamins D and B12, they are also an excellent source of calcium and omega-3 fatty acids. Do NOT be fooled by other sardines. Conservas de Cambados makes a "Gourmet" line, which is their highest quality, and the ONLY ones we sell. 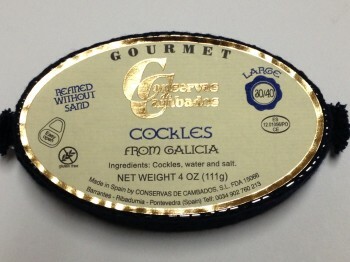 "Gourmet" is clearly at the top of the front label as shown in the photo, the "Conservas de Cambados" logo is prominently displayed, and the tin is rectangular with rounded corners. Their other line "Bogar/Alamar" is made with imported seafood (not from Spain) or with lower quality seafood from outside of Galicia. When in doubt verify the front label says "Gourmet" at the top, "Made in Spain by CONSERVAS DE CAMBADOS, S.A. FDA 15066" at the bottom, shows the "Conservas de Cambados" logo, and it is in a rectangular tin with rounded corners. Ingredients: Small sardines, olive oil and salt. Pollen Ranch hand harvests wild fennel pollen from private organic farms in California where fennel grows wild. They not only offer pure fennel and dill pollens, but Chef Bernard has taken these pollens to the next level, combining them with other herbs and spices to create a very special line of spice blends to complement and enhance vegetables, seafood, poultry, pork, beef, lamb, and even desserts!! Your pork and chicken will never be the same when they’re encrusted in this warm and toasty herb and seasoning blend. Crushed pecans give a nutty flavor, and cumin adds a touch of savory smoke that goes perfectly with any pork or poultry dish. Light citrus tones brighten and balance the flavor of this warm, aromatic blend. Add a dash to your chicken and dumplings to add depth of flavor, rub it on your chicken, or roll a pork tenderloin in it before roasting for a mellow spiciness that compliments the tender pork exquisitely. Nutty, flavorful, and delectable, this will be your "go to" seasoning for poultry and pork. Bon Appetit named Pollen Ranch to the Top 15 Italian Pantry Staples Made in America! 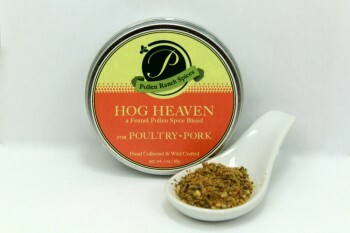 Try this magical Hog Heaven Spice Blend to create amazing dishes in your own kitchen. We can special order this for you. Please click "add to cart", and enter your email address. When we have enough interest we will contact you. Balsamina is a balsamic jelly made from an aged balsamic condiment. The sweetness of this decadent condiment dances on your tongue. This is one of our favorite products, unique and quite special. It pairs perfectly with creamy cheeses and cured meats. We recently had it on smoked sturgeon as an appetizer, , we use it on roasted and grilled chicken in the summertime, and of course we pull it out over Thanksgiving instead of the traditional cranberry sauce. Spreading it on slices of roasted turkey is simply divine! It has a magical flavor, and great mouth feel, that you don't get anywhere else. Please give it a try and find out why we went all the way to Italy to bring it back for you. 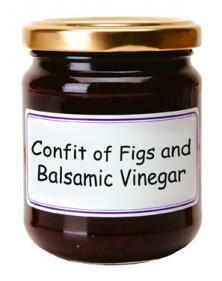 Perfect for your own kitchens, and it makes a beautiful gift in its thick-glass, wide-mouthed jar. Cattani has developed this jam especially for us, upholding our high standards of quality and our commitment to the best flavors the Mediterranean has to offer. José Páez Lobato is a family enterprise that specializes in the making of fine sherry vinegar. The Bodega, or cellar, was founded in 1933 by Francisco Paez Sanchez, and is now managed by his sons. This 50 year old sherry vinegar is characterized by its amber color, delicate smell, and unique taste... all of which are due to a careful and prolonged aging process. 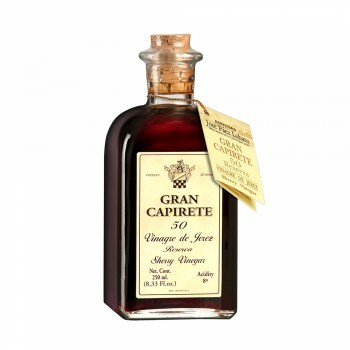 Gran Capirete is aged in American Oak barrels, and the solera that gave birth to it was established in 1946 (so it is actually 72 years old!). It has an unforgettable flavor, with a hint of nuttiness. 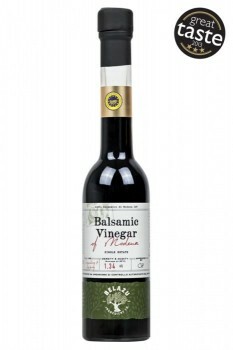 This vinegar is drier than balsamic vinegar and has an acidity of 8º. The production and quality of sherry vinegar is monitored and controlled by the Consejo Regulador, and sherry vinegar has its own Denominacion de Origen (D.O.) which is protected by Spanish and EU law. This vinegar carries the D.O. Vinagre de Jerez stamp of approval. Its complexity and depth of flavor greatly enhances soups, stews, sauces, casseroles, marinades, and dressings. Chianti Classico in the heart of Tuscany is the location for olive oil purists. Extra Virgin Olive Oil and Tuscany have been synonymous for centuries. Mannucci-Droandi is a true visionary, and Tuscan through and through. He is the originator of the organic revolution in this area. He is not only the reigning olive oil champion, but is one of the few truly organic top tier producers. Mannucci-Droandi is the leader in aroma and flavor in this part of the world. This organic extra virgin olive oil is thick and fruity with an intensity unmatched by anyone. This Mannucci-Droandi Organic Extra Virgin Olive Oil has an extremely low free oleic acid content and a high level of polyphenols, earning it a place among the best extra virgin olive oils in Italy. Mannucci-Droandi is one of the few oils in its zone, and the country, to be both organic and have the coveted D.O.P. (Denominazione di Origine Protetta) certification. It is an extraordinary extra virgin olive oil. One of the hardest Extra Virgin Olive Oils to obtain, only 3,000 bottles were made, this is Mannucci-Droandi's top of the line. Selected as one of the top 3 Extra Virgin Olive Oils in the Chianti Classico zone. Featured in Marco Oreggia’s Guide to Italy's Top Extra Virgin Olive Oils. Featured in the Slow Food Guide to Italian E.V.O.O. Produced and bottled by Mannucci-Droandi with olives grown, harvested, and pressed at the Mannucci-Droandi Estate in Italy. The Savini family business is world famous for their truffles. Starting in the 1920s, and continuing to this day, the family tradition of handcrafted truffle products has spanned over four generations. During the harvest, the truffle gatherers collect both large and small truffles. The biggest ones are sold fresh to restaurants, while the smaller ones, with equally impressive flavor, are sliced, and through a very special proprietary method, preserved in olive oil. The flavor is identical to the fresh truffles, with the added benefit that you can keep them unopened in your kitchen for more than a year, and thus can have "fresh truffle flavor" anytime on a moment's notice. These sliced black truffles are of the highest quality, and the Savini family ensures the origin of each and every truffle. This guarantees both the quality and freshness. Every jar shows a "best by" date so you know you are getting the freshest truffles available. Start your day off with a perfectly cooked egg and some sliced black truffles. Stuff sliced black truffles under the skin of a chicken before roasting. Add some slices to freshly cooked pasta... amazing! A few slices on hot seared or grilled scallops is otherworldly. Mix them into your risotto 15 minutes before it is done to make truffle risotto! Save the olive oil, and you have authentic truffle oil! Ingredients: 50% Italian black truffle (Tuber aestivum Vitt. ), olive oil, salt, truffle flavor, garlic, herbs, spice. Click "Add to Cart" and enter your email address to be notified when this is back in stock. Raymond Blanc, owner of the Michelin 2-Star Restaurant Le Manoir aux Quat' Saisons, says "Belazu's Balsamic Vinegar is a must have ingredient in any kitchen, we wouldn't be without it at Le Manoir aux Quat' Saisons." Carefully produced by a small family firm in Modena, Italy, this exceptional traditional balsamic vinegar is a blend of cooked Trebbiano grape must (unfermented grape juice) and red wine vinegar. Over time, the blend evaporates in a series of wooden casks and the natural fruit sugars in the must contribute to the viscosity, and sweetness, of this remarkable vinegar. The Good Housekeeping Institute Taste Test (August 2002, UK Edition) voted Belazu 1st Choice, stating that Belazu was a deep, rich brown vinegar with a thick, treacly consistency, a delicious oak flavour, hints of caramelised sugar and good contrast to the sharp acidity. You cannot imagine how good and mellow this is. a caprese salad. It really makes this already wonderful dish incredible. A little bit will do it, but we always tend to put on just a touch more. hot pizza fresh out of the oven. Belazu gives it an outstanding flavor! Belazu is our favorite Balsamic Vinegar and we highly recommend you try a bottle! Buy 2 or more, and get them for only $50 each! A unique oil with a mildly toasted, nutty flavor. It is known as "the golden oil." The Argan tree is unique to the South Western corner of Morocco and is called the "tree of life" due to the importance of this tree, and its fruit and oil, to Moroccan traditions and culture. This remarkable organic Argan oil is made by cold pressing the seeds inside the nut of the Argan fruit. It takes 100 kilograms (220 pounds) of fruit to produce just 1 liter (33.8 fluid ounces) of oil, meaning it is an extremely labor intensive oil to produce. Once the fruit ripens, it is harvested and laid out in the sun to dry. The flesh of the fruit is removed, and the hard shell of the nut is cracked to remove the almond shaped kernels inside. These are gently toasted and, once cooled, ground in a stone ‘rotary quern’, similar to a stone pestle and mortar. The resulting nut paste is then massaged by hand to extract the luscious oil. Rich in Vitamin E and linoleic acids, and with a high unsaturated fatty acid content (over 80%), this unique organic Argan oil is full of health-giving properties. Vitamin E promotes healthy hair, skin, and nails, and the unsaturated fatty acids are great for keeping the heart healthy and lowering cholesterol levels. Initial tests indicate it may reverse the metabolic changes that occur from a high sugar diet, thus being a natural aid in the fight against diabetes; and the high levels of antioxidants show promise in fighting cancer. It is light in color with a reddish tinge and it is milder in flavor than sesame or walnut oil, yet its taste is distinctly nutty. Traditionally used for cooking tagines and dressing couscous, organic Argan oil also adds a unique and wonderful flavor to salads and other North African dishes. Mix organic Argan oil with honey and yogurt like the Berbers do for a nutritious breakfast. Make amlou: a mixture of Argan oil, honey, and crushed almonds. It tastes a little like peanut butter and is great on toast. 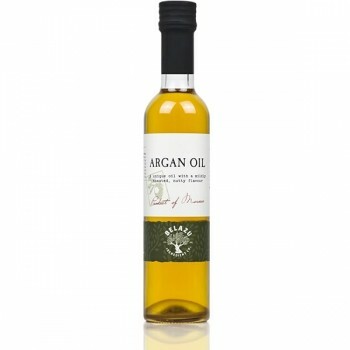 This organic Argan oil is suitable for vegans, vegetarians, and is gluten-free. Rural Moroccans always knew Argan oil was good for you, inside and out. They actually rub their faces with their hands after eating a couscous dressed with Argan oil. In the spirit of that tradition, we can also recommend it for its beauty uses!! Since this oil is organic AND "food grade" it is higher in quality than those other "cosmetic grade" oils on the market today. This product may not be suitable for nut allergy sufferers. Packed in France from Moroccan oil. Note our competitors are selling a 4 ounce bottle for $96.00, and it is not even organic. The Fallot family has enjoyed a worldwide reputation for exceptional quality. They started creating mustards in 1840, in Beaune, France near Dijon. The mustard seeds are selected for their high quality and then are ground in a traditional stone mill. This traditional process preserves the pure flavor we all expect and demand. 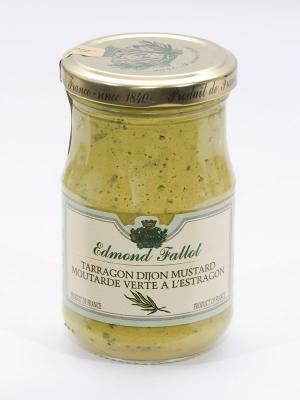 This Tarragon Mustard is outstanding. The pure flavor of fresh tarragon, combined with the wonderful Dijon Mustard, creates a flavor combination that will amaze you. Perfect with chicken, great on pork, and exciting when used in your salad dressings. 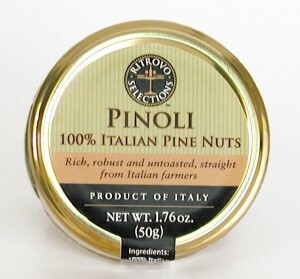 These are the only certified 100% Italian Pine Nuts in the USA. They even go through customs with their own certificate of authenticity. To find these gems Ritrovo scoured Italy, eliminating from consideration any pine nuts that might be blended from Turkish or Greek sources, and completely shying away from the oilier, more rounded and petite, central Asian and Chinese nuts which can cause "pine mouth". They found a certified 100% Italian source of pine nuts, our great friends Nicola DeLaurentiis and his wife Paola at Casina Rossa. We are happy to be able to offer them to you. Enjoy! The Laguiole knife, from the south of France, has a history dating back to the early 1800s. The distinctive bee, a mark identifying, and distinguishing, all Laguiole products, comes from the imperial seal of Napoleon Bonaparte. They are hand-made and go through 25 different, highly-refined production processes in order to guarantee each piece is made to the exacting standards Jean Dubost, and you, expect and demand. A Certificate of Authenticity is included with each set. This is quite possibly the finest lard available. It is rendered from the the prized "leaf" (internal fat which contains no meat muscle) which makes it less "porky" tasting than regular lard. This amazing lard is delicate, light, and mild tasting. Bakers have cherished Leaf Lard because it creates the best crusts and cakes while not imparting any flavor of its own. Leaf Lard also has a high smoke point (375F), making it perfect for frying and sauteing, especially when you want the natural flavors of your ingredients to shine. 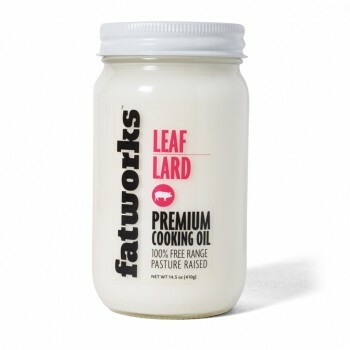 Fat Works Pure Premium Pasture Raised Leaf Lard is essential for anyone interested in cooking with traditional fat. Take a bite of what you make with it and you'll easily understand why we love having it in our own kitchens! Shelf stable at room temperature. Two words describe the Sicilian terrain where our producer and friend, the Marino family, has generational roots as far back as they can remember: warm and pure. The Marino family proudly produces organic products on their farm in southeastern Sicily in the Italian province of Siracusa. Their native terroir, enriched by the Sicilian sun, as well as by tradition-bound stewardship, yields deep, pure, amazing flavors. 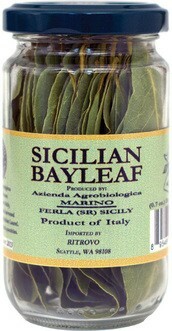 Grown in the prestigious Monte Iblei zone of southeastern Sicily, this Organic Bay Leaf, from Sicilian Laurel, is hand harvested. This is a micro-production, we only get 12 jars a year. GRAB SOME for your own kitchen! 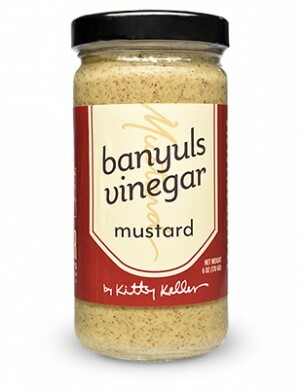 We have always wanted to carry a French mustard made with Banyuls Vinegar. We thought of importing such a mustard except the 100% import tax made the price seem ridiculous. It is good, but is it $25 good? Maybe, but who wants to pay $20+ for mustard? So we finally decided to make our own in the classic French tradition. This is a coarse mustard with our Vinegar of Banyuls (La Cave de l'Abbe Rous), a touch of water, mustard seeds, sea salt, and a dash of turmeric to keep the color. We not so humbly admit that we love this more than similar imported mustards, and can bring it to you at 1/2 their cost! We use it on hotdogs, sausages, hamburgers, and when combined with fresh oregano, freshly minced garlic, Fleur de Sel Sea Salt, freshly ground black pepper, and extra virgin olive oil, we have the perfect marinating rub for lamb. We think this is fantastic and something you'll be proud to have in your kitchens! Master Jam Maker Bernard Le Gulvout's traditional techniques for small-scale production use an open jelly pan, the only way of bringing out the full subtlety of the flavors while retaining the richness of the natural colors. L'Epicurien has recreated the flavors of bygone days and produces unexpected combinations of tastes to ensure that eating is always a pleasure. Tenacity, Know How and Passion enabled L’Epicurien to win an award for their range “Cheese & Fruit Confits”. Based on traditional recipes, these savory confits provide an opportunity to taste some special flavor combinations. Serve them with meat or fish dishes, or spread them on mini-toasts as an appetizer. 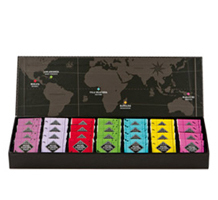 They are a tasting experience that transports you to the Mediterranean and beyond. Ingredients: figs (60%), cane sugar, balsamic vinegar (wine vinegar, concentrated and cooked grape must, caramel coloring), spices. 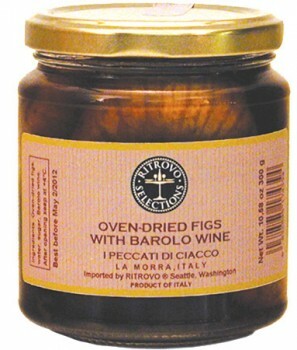 Sweet whole figs flavored with Barolo, “the King of Wines”. 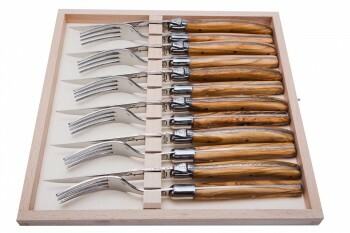 An elegant companion for cheese plates and meat dishes. I Peccati di Ciacco is a first choice for lovers of Piedmontese cuisine at its best! Made in the village of La Morra, outside Alba, each product is carefully made in small lots according to regionally-inspired recipes. 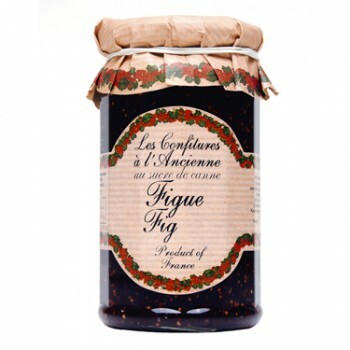 This artisanal process maintains the vibrant freshness, and homemade goodness, of these amazing figs! 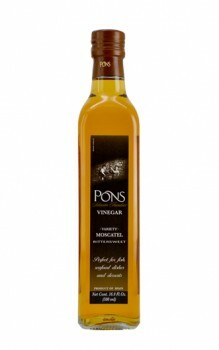 This Moscatel Vinegar is made exclusively from Moscatel (Muscat) grapes. This vinegar, made in Catalonia, Spain, is characterized by a gentle, fragrant aroma and flavor. It is especially recommended for fish, seafood dishes, and desserts. We also think its sweet tones are ideal in many marinades, and of course it makes an exciting salad dressing when combined with your favorite extra virgin olive oil. 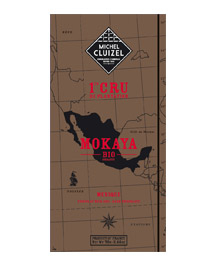 Ingredients: Moscatel wine vinegar (80%), concentrated grape juice of Moscatel grapes (20%). In a mild mini-climate near the town of Guèrande in the cultural region of Brittany, France there are centuries old salt fields. In this unique location the currents of the Atlantic run cleaner than in many of the other salt harvesting regions of France. As a result, Guèrande produces the best salt in all of France. On warm, breezy afternoons from May to September, an artisan paludier (craftsman salt harvester) like Gilles Hervy can "sweep" the crystallized top of the evaporating sea water. This harvested salt, the Fleur de Sel, is the most delicate, purest part of the saline. What remains and crystallizes throughout the rest of the season is the Sel Gris. For every 80 pounds of Sel Gris produced, they can harvest only one pound of the precious Fleur de Sel. 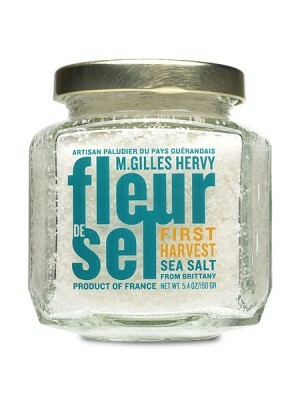 Fleur de Sel is an all-natural sea salt from Brittany, France. It is unprocessed, unrefined, and unadulterated. It does not contain anti-caking or anti-flowing agents. It is known as the "Caviar of Salts". The Gilles Hervy family (husband, wife, two sons, and a daughter) sells the best, most consistent quality Fleur de Sel in the world. 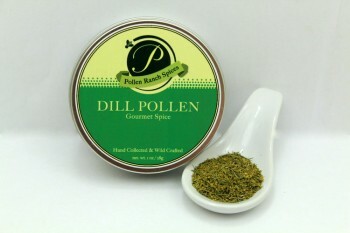 Pollen Ranch hand harvests dill pollen from private organic farms in California where dill grows wild. They not only offer pure fennel and dill pollens, but Chef Bernard has taken these pollens to the next level, combining them with other herbs and spices to create a very special line of spice blends to complement and enhance vegetables, seafood, poultry, pork, beef, lamb and even desserts!! The spirit of the Basque people is most evident in the vibrant colors and patterns woven into their linen. For the past thirty years, Jean Vier has created fabrics based on these patterns from 100% natural cotton and flax. The resulting linen is elegant, long lasting, and the highest quality. Delightful to the touch and beautiful to behold, Jean Vier linen is a perfect addition to any kitchen or dinner table. The universal designs, and timeless elegance, suit any home interior. Drawing on a weaving tradition that dates back to the Middle Ages, Jean Vier produces both historical and contemporary versions of distinctive fabrics. They're unique in their legendary color resistance: Soak new linens overnight in cold water, and those vivid hues won't fade even after multiple washes. This over-sized cotton tea towel is woven with a Jacquard weave, so the pattern is woven into the fabric instead of printed onto the fabric, so the pattern never rubs off, but instead lasts forever. These towels are machine washable, making them very easy to clean. 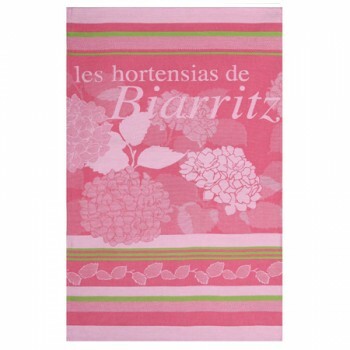 This tea towel features light pink hydrangea flowers on a dark pink background with lime green stripes across the top and bottom. One Tea Towel: 24" x 36"
This over-sized cotton tea towel is woven with a Jacquard weave, so the pattern is woven into the fabric instead of printed onto the fabric, so the pattern does not rub off, but instead lasts forever. These towels are machine washable, making them very easy to clean. 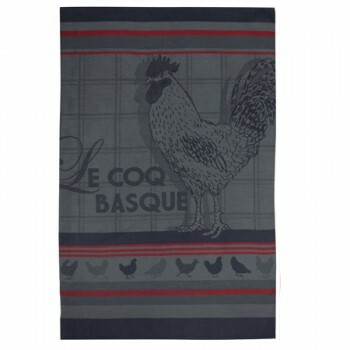 This style features a large dark grey rooster on a light grey background with dark grey and red stripes across the top and bottom, and a row of smaller grey chicken silhouettes at the bottom.